Joakim Breitenstein (JB): In the previous post we discussed technical and process related challenges of feedback in urban planning. Another challenge is how different stakeholders are not willing to give up their agendas. How could we get more concrete outcomes of dialogue in urban planning? Antti Jogi Poikola (AJP): Current debate is often about concrete plans. These plans are created by planners or consultants who have made significant assumptions before public debate even begins. This might not be the best and most efficient way to progress in dialogue. We should increasingly discuss initial assumptions in addition to debating competing ideas. These initial assumptions can be either factual or based on personal values. JB: What do you mean by these initial assumptions exactly? AJP: Let’s take the idea of transforming Helsinki’s central motorways into boulevards as an example. We have two competing ideas for organizing car traffic in an area – A; a boulevard and B; a motorway. In this case the initial assumptions could be 1; there will be less private car traffic in the future and 2; there will be more private car traffic in the future. Besides discussing which plan is better (boulevard vs. motorway), the community should discuss different initial assumptions (such as private car traffic will decrease/increase). This would allow discussing the impact of an idea rather than the plan itself. In this case we should discuss what kind of impact does boulevards and motorways have on our city if private car traffic will either decrease (A+1 vs. B+1) or increase (A+2 vs. B+2) in the future. Future scenarios would be generated by combining different ideas with different initial assumptions. Based on these scenarios, people would choose what kind of future they want to live in. …and there are people who want motorways. We have two competing ideas for organizing traffic in an area – A; a boulevard and B; a motorway. …we should debate initial assumptions (i.e. future scenarios). …or 2; there will be more private car traffic in the future? Now, let’s test our ideas against our initial assumptions. Are boulevards (A) or motorways (B) better in a future where private car traffic will decrease (1)? Here it is assumed that boulevards are better because they provide better circumstances for including alternative systems (such as rails and bicycle/pedestrian lanes) in the space reserved for traffic. 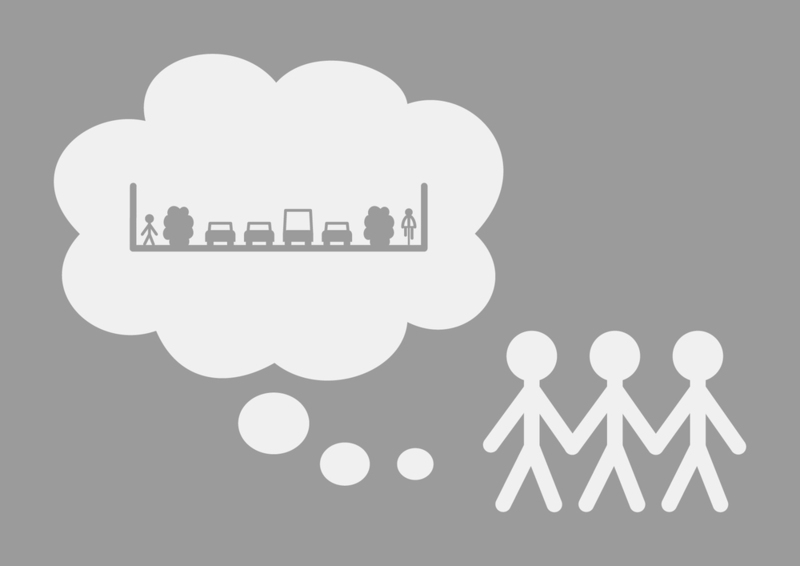 How is it if private car traffic will increase (2) in the future? Are boulevards (A) or motorways (B) better? Here it is assumed that motorways are better because they provide better circumstances for handling a growing amount of private cars in the space reserved for traffic. First, the community decides what kind of future they believe in. Then they test different ideas to support building that future. The goal is to test how different ideas and plans (second column) work together with different initial assumptions and visions about the future (first column) and finally end up with the best combinations (third column). This helps taking discussion towards building a common future rather than arguing about who likes which idea better. If the discussion is about building boulevards or motorways, we should not focus on who likes which idea better but rather on whether we believe that there will be more or less private car traffic in the future (and other initial assumptions). JB: How would you sum up the concept of initial assumptions in urban planning? AJP: If we would focus on debating where we want to go as a community (initial assumptions) instead of arbitrary details (concrete proposals), our political decisions would reach our built environment faster. In other words we would narrow the gap between politics and urban planning. This is an interesting hypothesis but we have to ensure that discussion does not become too political and abstract, that it is still tied to our physical environment and that decisions are made. The most important thing is to change our attitudes but we also need to develop our systems to support a more lean way of working. We need to create decision making tools to support a more continuous and productive dialogue between different stakeholders while still pushing towards common conclusions and decisions.